The Kaneko Gallery hosts the annual Student Show featuring an artist's reception and announced the winners of the artists who submitted their pieces. The annual Student Show kicked off Monday at the James Kaneko Gallery with an artists’ reception and the announcing of the winners of the student entries’ works. The show consisted of submissions chosen by the portfolio and gallery art students at American River College and is organized entirely by students. Among the artists who submitted work for entry in the show was Best in Show winner Andrea Arnott, who has multiple works in the showcase. Her winner, a surrealist sketch called “Caterpillar Pillars,” won her $200. Mick Sheldon, the director of the Kaneko Gallery, announced the winners of Best in Show and first through third place, each taking home cash prizes ranging from $100 to $200. Sheldon emphasized the importance of the art students running the event. Students who viewed the show also had the opportunity to vote for their favorite piece for the People’s Choice Award, which will be announced at the end of the show’s run. The Student Show is the culmination of art students’ work at ARC for the spring semester, and serves as a jumping off point for Art and Tech Day, which will be held Friday. Every spring, ARC shows off their art programs during Art and Tech Day to visiting high school students who may be interested in taking art classes. The high school students also get to vote for People’s Choice Award. Several students attended the reception, and enthusiasm for the works was high, as they were all created by ARC students. Next week, two more prizes will be announced; the Dean’s and President’s Award, and will also include cash prizes up to $150. The Student Show will run until May 14, and during its run, any student may view the showcase and vote for their favorite piece. Students need to include why they liked their choice for the piece they liked the most. The work of over 20 students is featured, from sketches and paintings to sculptures and new art media. 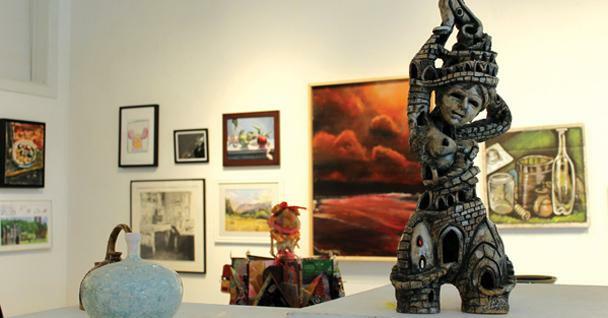 Be the first to comment on "Kaneko Gallery hosts the annual Student Show"